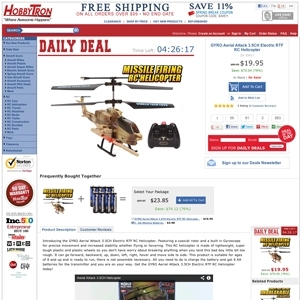 Based out of Santa Clarita, CA and founded in 2000, Hobbytron.com offers a huge selection of airsoft guns, RC vehicles, toys and more -- and in addition to their site, the company also operates a few retail stores in CA that are named Airsoft & Hobby World. Hobbytron.com currently ranks #76 amongst sites offering online deals -- Mr Watch ranks #75. In the General Merchandise category, HobbyTron ranks at #29 -- Yugster ranks #28.